CLIMATE: Cold, snowy in winter. Warm and pleasant in summer. BEST TIME TO VISIT: Summer COMMENTS: Not a ghost town, but a former pleasure boat run by the late Wally McPherson. Remains of the boat still visible. REMAINS: Remains of hull, dry dock facilities. 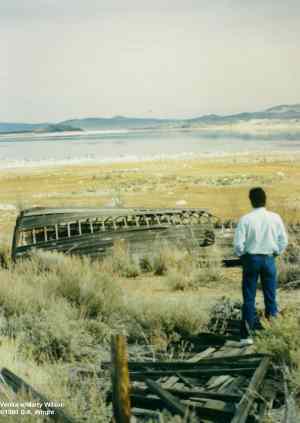 The Venita was a pleasure craft that once plied the blue waters of Mono Lake. Built in the early 1930s, it was used until wrecked during a winter storm while in dry dock in 1950. The boat was a 35' long craft, powered by a Ford flathead V-8. The boat was owned by Wally McPherson, who died in 1995. Wally was born in Bishop, raised at his family home on Paoha Island on Mono Lake. His mother was Venita McPherson, who was the namesake of the boat and who was a Mono County Board of Supervisors member for many years. Wally and his wife owned the Mono Inn, which is still in business, and while under his ownership he used the Venita to take guests out on pleasure cruises on Mono Lake. The Venita was once thrashed in a storm in the late 1940s and lost her cabin. She was killed off for good in 1950 while in dry dock during a winter storm. A high gust of wind sent her hurling through the air, where she came to rest upside down, she still lies there to this day. 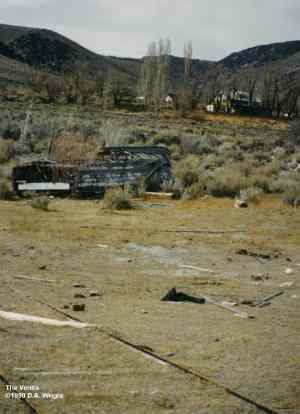 The remains of the boat sits on private property behind the Mono Inn, but can be seen by those with sharp eyes (and a good pair of binoculars) from US395. The Venita leaving her dock at Mono Lake in 1940. Photo courtesy of the late Wally McPherson. D.A. Wright collection. The predicessor of the Venita, the Paoha, shown on its dry dock below the Mono Inn. When the Venita succeeded the Paoha, it also used the same facility. Remenents of the dry dock can still be seen today. Photo courtesy of the late Wally McPherson. D.A. Wright collection. The Paoha, predicessor of Venita, shown on a flatbed of the narrow gauge Southern Pacific Railroad (ex-Carson & Colorado Railroad) at Benton Station, California. This photo was taken when the McPherson's were taking delivery of the Paoha. Photo courtesy of the late Wally McPherson. D.A. Wright collection. Remains of the marina facility for the Venita and her predicessor, the Paoha. January 1990. D.A. Wright photo. Marty Wilson inspects the ruin of the Venita. January 1990. D.A. Wright photo. 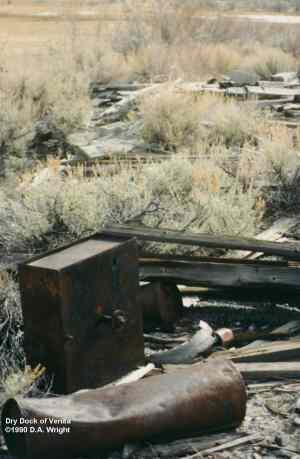 Alan Patera, publisher of WESTERN PLACES Magazine, inspects the ruins of the Venita on the shore of Mono Lake. August 1990. D.A. Wright photo. Remains of the Venita. View southeast. August 1999. D.A. Wright photo. Remains of the Venita. View northeast. August 1999. D.A. Wright photo. Remains of the Venita and part of the dock facility. August 1999. D.A. Wright photo. Remains of the docking facility of the Venita. August 1999. D.A. Wright photo. Remains of the Venita. Rails of the dry dock in foreground. Mono Inn in the background. January 1990. D.A. Wright photo. 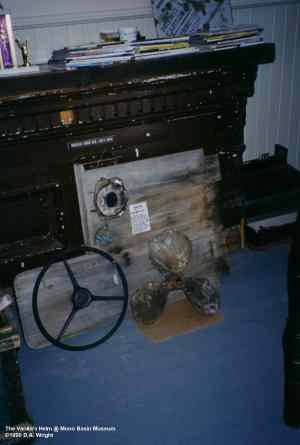 The helm of the Venita on display at the Mono Basin Historical Society Museum in Lee Vining, California. January 1990. D.A. Wright photo. 1940 brochure for Mono Inn, advertising the Mono Lake region and boat rides aboard the Venita. Photo courtesy of the late Wally McPherson. D.A. Wright collection.